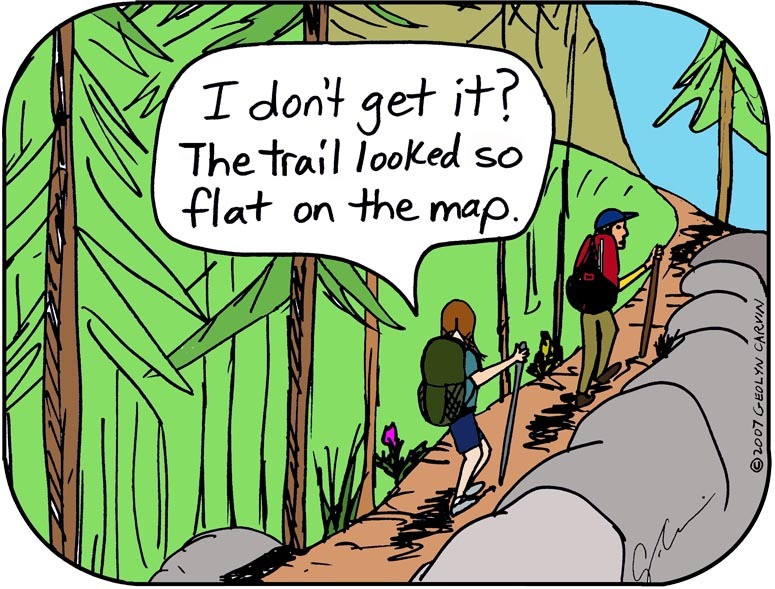 Chuckle Monday – Another problem when hiking! All our hikes look great on paper, that is until we check the altitude gain. It’s easier not to think about it until it’s too late. ← Why tarp your RV? Valuable tips to make the right decision. I drove 1000 miles from North Carolina to Iowa and found a lovely direct road on the map. It took me through the mountains in the middle of the winter traveling at 5-10mph for miles. 18hours later I arrived in Iowa. Never made that mistake again!! This cartoon brings back memories! Hmmmm….this is totally us in the Rockies, the Guadalupes, the Smokies, the Porcupines…you get the drift! You would think it would be an easier lesson to learn but it’s not. We have done it several times as well.